"Prerequisites" are basic hygiene measures that should be in place in your food business prior to you undertaking a HACCP study. They include matters such as supplier approval, incoming material specifications, finished product specifications and staff training. The MyHACCP tool shows you a list of common prerequisites and asks you to select the ones you have properly considered and for which you have put in place adequate controls. You will then be invited to identify the location of documents such as policies and procedures where further details of these prerequisite controls may be found. It is common for food businesses to place all these documents into a “prerequisite manual” for ease of reference, but this is not a requirement. The list of prerequisites in MyHACCP is not exhaustive and there may be other matters, such as temperature control, which are relevant for your business. Once you have identified which prerequisites are relevant to your business, you should develop procedures, or review existing documentation, to ensure that adequate control measures are in place. Top tip: Use the list of common prerequisites in MyHACCP as a checklist to ensure that you have properly considered all the relevant hygiene measures that should be in place before you start your HACCP study. Read about the general requirements for each prerequisite listed in the MyHACCP Web Tool. Most prerequisites are general in nature and their purpose is to ensure the general hygiene conditions of the food business. However, some prerequisites may be identified through the HACCP study as being critical to food safety to control a specific hazard. These are referred to as “Operational Prerequisites” or “OPR” and they should be carefully identified and managed. Find out more about Operational Prerequisites. The preparation and effective implementation of a HACCP system requires both time and effort not just on the part of the HACCP development team but also by everyone who is involved in the preparation and handling of your food. As such, there should be a clear statement by management which commits their support to the process. The MyHACCP tool will ask you to provide evidence that such management commitment has been obtained. It is best for the commitment to be made in the form of a clear written statement of management support for the HACCP process which gives authority to the HACCP team and can be referred to in staff briefings and training sessions. It would also be helpful to include details of the resources that will be made available for the process. You might prefer to include the commitment to HACCP within a broader food safety policy that you make available to both staff and customers, for example on your website, to demonstrate your determination to develop and implement an effective food safety management. Smaller food businesses in particular may choose to simply make such a declaration. Allocation of sufficient staff resources to complete the HACCP study and implement the HACCP system. Recruitment of any specialist staff needed to support the HACCP team. Raising awareness of the HACCP process with all staff and provide sufficient training to those directly involved in the study. Involvement of members of the management team as necessary. A commitment to provide timely management decisions as required by the HACCP team to facilitate the development and implementation of the HACCP. Purchase of additional equipment as required to ensure the effective operation of the HACCP system. You are asked to choose between a “Linear” or a “Modular” plan and you should select the appropriate one based on the complexity of your food operation. A linear HACCP plan is one which considers each product as a whole, starting from the raw materials and ending with the finished product. A modular plan produces a plan made up of a series of building blocks or modules. This would be suitable for a basic food production process where only a limited number of products are produced. 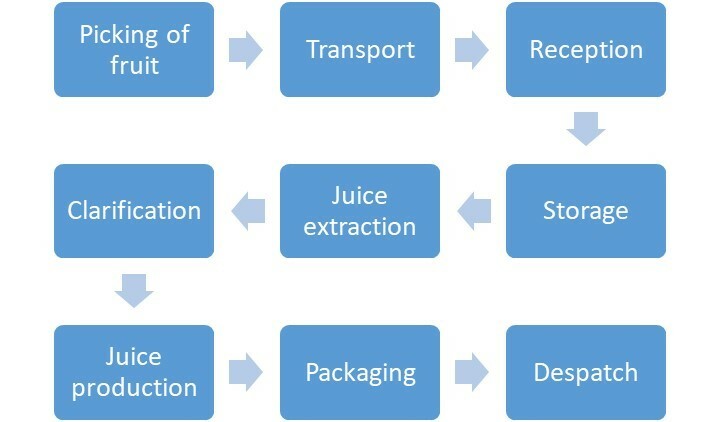 For example, a manufacturer of orange juice may choose this approach because the manufacturing process involves a relatively small number of process steps. However, if the manufacturer decides to extend its product range to include apple, grapefruit and pineapple juices then a modular approach may be more suitable. This is an example of a “linear HACCP” plan because the process flows in a simple line from one process step to another. The diagram shows a linear plan with stages which follow each other in order. This is the more common approach where the food production process is more complex and typically involves several steps which are shared with other products. The HACCP principles can be applied to specific activities or “modules” which are then added together to make a complete HACCP plan. The hazards and controls will be the same for these operations, irrespective of the type of juice produced and so once the HACCP has been completed for each, they can be used wherever relevant for different products. The diagram shows one module of a modular HACCP plan, relating to fruit reception in the production of fruit juices. The module contains steps which follow each other in order. The HACCP plan for each step could be used for any product type where the processes involved are the same, because the hazards and controls will also be the same. You may choose to undertake a HACCP study of an individual product or prefer to group similar products together and include them in the same study. Whichever you prefer, you should clearly state your choice and include details of any relevant packaging. For example, “Manufacture of vacuum packed sliced ham” or “Preparation of individually boxed fresh cream cakes”. The typical study will begin with the intake of ingredients and will end with the despatch of the final product. However, in order to achieve food safety, you may need to consider activities not just within your own establishment but also those carried out by others such as distributors, retailers and customers. Of course you cannot be sure how your food is handled once it has left your control, but you should consider whether the study needs to include details of the likely way that others will handle your products and take these into account by, for example, providing instructions on the product label and/or packaging for storage and use. 4. What hazards will the HACCP plan cover? The purpose of this step is to identify a “long list” of potential hazards which may be relevant to the production of your food. Hazards are anything which have the potential to cause harm and you will be required to identify hazards which fall into four categories: Physical, Chemical, Microbiological and Allergens. Physical hazards are specifically associated with a food, for example bones in fish or stones in fruit, or where a residual risk exists once appropriate pre-requisite controls have been put in place. For example, glass contamination in areas where products are packed in glass containers. Chemical hazards might include, for example, detergent residues from cleaning or chemical residues from farming practices such as antibiotic residues in milk. Microbiological hazards will include relevant bacteria, such as Salmonella, viruses such as norovirus and parasites such as nematodes. In most cases microbiological hazards should be specifically identified rather than merely classifying them by type such as “bacteria” or “viruses”. This is because different microorganisms will have different growth, death and survival characteristics which must be addressed separately in the HACCP plan. At this stage, you are simply choosing hazards from a suggested list which you consider might be relevant to your food. You will be required to evaluate these hazards, identifying those which are significant and placing them on a "short list" later in the study. Feel free to add any other hazards that you can think of but which are not included in the list, but do not get carried away. You should take a realistic approach to this step and only include hazards that are likely to be of concern. 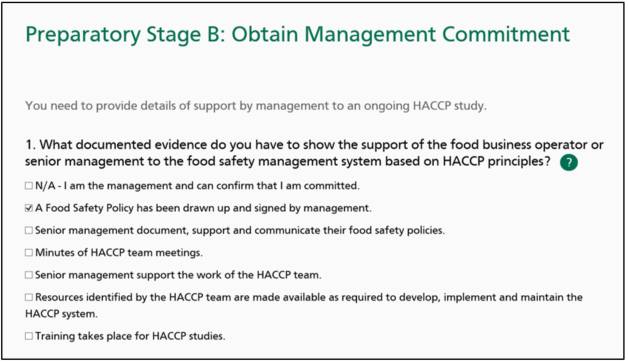 There are a number of documents that are relevant to your HACCP study but in this part of the tool you should record those documents which either set out your procedures for implementing an effective pre-requisite programme (explained in Preparatory Stage A) or those documents that you have relied upon to identify hazards. The preparation of a HACCP plan involves a thorough review of the activities undertaken or proposed by the business and then the collection and evaluation of scientific and technical data relating to the production and handling of relevant products. Not every member of the HACCP team needs to have a detailed knowledge of all these aspects, but they should collectively have sufficient knowledge of all the food activities being considered by the study as well as a thorough technical knowledge of relevant food safety matters. Members of the team should be drawn from all relevant areas of the business and from all relevant staff levels. There should be, where possible, a healthy mix of management and operators from different parts of the business. The team should possess adequate technical knowledge to identify relevant hazards and appropriate controls. The team should also include members with sufficient practical knowledge of the process to advise on the practicalities of implementing such controls. Members of the team should be provided with sufficient training and management support to allow them to participate freely in the HACCP team. In small businesses, one or two people may take on the role of the HACCP team. Some members of the team will be required throughout the study, for example those possessing technical knowledge and an understanding of the processes in overview. Others, who may have more specific knowledge at certain process steps, may be brought onto the team at relevant points during the study. Each member of the HACCP team must be clear of their role, have been provided with adequate training and have been given express authority by management to participate effectively in the HACCP study. To satisfy these requirements, you may find it helpful to create a HACCP team matrix, summarising the selection, roles, responsibilities and authorities of HACCP team members for each step. Whilst there are several different roles to be fulfilled within a HACCP team, it is a matter for each business to decide whether these roles are allocated to individual team members or whether some team members can undertake several roles. In small businesses, one person may assume several or all of these roles. Administrative – Members of the administrative group will be responsible for ensuring that the HACCP process is completed in a logical way and adequately documented. They will typically need a detailed understanding of the HACCP process. Technical – Members of this group will have a detailed understanding of food science, technology and hygiene as well as a good knowledge of HACCP. Operational – Members of this group should have a detailed knowledge of how the business operates in practice. Other – Additional expertise should be recruited into the HACCP team as necessary. The HACCP lead should have a sound understanding of HACCP and a good knowledge of both the food activities that form part of the study and the technical information that underpins it. The person named in the study will be responsible for managing the HACCP study and so should possess good management and communication skills. The full name of the HACCP lead should be given. The competence of the person nominated as the HACCP lead can be demonstrated by recording any relevant training that they have completed, their qualifications gained and their relevant experience. Qualifications: Any relevant qualifications, such as those gained in food science, technology or microbiology should be recorded. Relevant experience: Such experience may have been gained in the preparation and/or implementation of HACCP systems in other food businesses or in the auditing of HACP systems. Once the details for the HACCP lead have been recorded, the process should be repeated for each member of the HACCP team. The full name of the team member should be given. Is this person Internal or External to the company? HACCP plans are best developed by those who know the business and will be required to implement controls identified by the HACCP team. As such, where possible, members of the HACCP team should be drawn from employees working within the business. Such employees are referred to as “internal” for the purposes of the study. However, the HACCP lead may identify areas where there is insufficient knowledge or experience within the business to properly consider the control of all relevant food hazards. As such it may be appropriate to appoint external consultants, advisers or temporary employees to perform some roles within the HACCP team. What is the role of this individual in the HACCP team? Technical Manager: Member of administrative and technical groups. Provide technical expertise in the identification and control of hazards. Consultant: Member of technical group. Advise on the application of HACCP principles. Production Supervisor: Member of operational group. Advise on process steps and practicality of implementation of control measures. Quality assurance technician: Member of administrative group. Writing of HACCP plan, note taking at HACCP meetings. The law requires that those responsible for the development and maintenance of HACCP procedures have received adequate training in the application of the HACCP principles. As such, there is no legal requirement for members of the HACCP team to have completed any formal accredited HACCP training, but it is recommended that each member undertakes at least a Level 2 HACCP in Manufacturing course or similar. Any relevant qualifications should be recorded although it is not a requirement that all members of the HACCP team possess academic qualifications. Relevant vocational qualifications should be included for example “Basic fork lift truck training” or “Certificate in logistics”. 3. Do you consider the team to have sufficient skills (scientific/technical knowledge and HACCP expertise) to ensure the HACCP study will be effective? The HACCP lead should undertake an honest appraisal of the competence of the HACCP team to produce an effective HACCP plan based collectively on their qualifications, experience and relevant training. Where gaps in knowledge are identified, these should be recorded and steps taken to bring additional members into the HACCP team to cover the gaps. The first principle of HACCP involves the identification of significant hazards associated with a food and the implementation of effective control measures to ensure that these hazards do not harm the consumer. information to be provided to the consumer regarding appropriate storage, handling and use. These factors are particularly important with respect to the control of microbiological hazards such as bacteria, which typically require moisture, favourable temperature conditions and time to grow to dangerous levels or produce harmful toxins. The purpose of this preparatory stage therefore is to describe your products in terms of their suitability or otherwise to permit the growth of dangerous bacteria, so that adequate control measures can be identified and implemented at a later stage as part of your HACCP study. Intrinsic factors: those found within the product itself such as its structure and composition. Extrinsic factors: those which are external to the food such as temperature control, packaging and method of processing. It is helpful to think about your food in this way because any changes in recipes or ingredients are likely to affect the intrinsic factors, whereas changes in equipment or in the distribution chain are likely to affect the extrinsic factors. If full information about both factors is made available to the HACCP team they may choose to control an identified hazard by a change in the recipe, a change in the method of distribution or both. All the information gathered in Preparatory Step E will be helpful to you when undertaking the hazard analysis of your products in Principle 1.2. This list will be of assistance later in the study to ensure that all ingredients are properly documented for each product and is of particular relevance to the control and provision of correct information to the consumer of the presence of food allergens. Water activity (aw) – this is the water that is available to microorganisms in the food. Whilst some foods may appear moist, the presence of sugar or salt in the liquid component of the food may prevent microorganisms from accessing the water thus restricting their growth. This is why the use of sugar, for example in jam making, or salt in the case of smoked salmon can be very effective at controlling the outgrowth of both spoilage and dangerous bacteria. Drying foods has an effect on both the moisture content and the aw. Pure water has an aw of 1.0 and the addition of salt or sugar will reduce this value closer to 0. Most bacteria require an aw value > 0.92 to successfully grow in food but some moulds may be able to grow below this. The aw value is most easily determined in liquid and homogenous foods where the sugar/salt content is likely to be evenly distributed throughout the food. Difficulties in determining a representative aw value may arise in composite foods which contain different varieties of ingredient distributed in an uneven way through the food, for example a meat stew. This will be a matter for your HACCP team to consider. pH – This is the measure of the acidity of a food and many bacteria are unable to grow in acidic conditions. For example, Salmonella species will typically grow well at neutral pH (7.0) but are unable to grow in acid conditions of 4.0 or below. As for aw, care should be taken to ensure that any pH measurements taken are representative of the food. For example, in a ready meal the pH of the curry sauce may be 5.5, which would inhibit the growth of some bacteria, but within clumps of vegetables it might be 7.0 which might permit the outgrowth of dangerous bacteria. Salt content – Whilst this affects the aw of the food, salt can also have an inhibitory effect on some bacteria in its own right. All the above factors influence the growth of microorganisms in food but so does a combination of these factors together. Some methods of packaging will affect the nature and likelihood of food hazards associated with a food. For example, hot filling product into glass jars or the use of vacuum packing will create anaerobic conditions (reduced oxygen levels) which will favour the growth of certain bacteria such as Clostridium botulinum. If you are using such materials, then your HACCP team will need to identify suitable controls to prevent the outgrowth and toxin formation by these dangerous bacteria. The packaging may also emit gasses or absorb them from the food, again changing the conditions for growth by microorganisms. Packaging could also protect microorganisms from damage by sunlight. The use of glass containers may introduce an additional physical hazard, especially if they are reusable, whereas the use of aseptic filling lines may reduce the likelihood of contamination from the environment. 5. How is the product going to be stored and distributed? Some common hazards will be controlled by freezing food, for example bacteria will not grow at frozen temperatures and most parasites, for example those found in fish, are destroyed by prolonged freezing of food. However, the storage and distribution of chilled foods may introduce additional hazards, such as Listeria monocytogenes. Prolonged ambient storage may render some foods susceptible to mould growth and toxin formation. The shelf life that you assign to your products should be sufficiently long to allow your customers to make full use of them. However, in general, the longer the shelf life of a product, the more likely it is to spoil within date and the more food safety hazards it will present. As such it is advisable to think carefully about the need for an extended shelf life and it may be appropriate to undertake shelf life testing to verify that the products perform as expected throughout their shelf life. If you are satisfied that no food safety issues will be presented by your products at the end of their shelf life, you should assign a “Best Before” date to the product. If, however, the food is likely to present a danger to health on expiry of the durability date, a “Use by” date should be applied. This page is currently being updated. Apologies for any inconveniences caused. The HACCP team need to have a thorough understanding of the intended use of the product(s) included in the HACCP study so that they may undertake an accurate hazard evaluation as part of the Hazard Analysis. The nature of the intended customer. The extent of any further processing of the food prior to consumption. You should consider whether the product is intended for supply to other food businesses or direct to the final consumer. You should also consider whether target consumers fall into one of the following vulnerable groups. Ask yourself “Do the consumers of my product have a particular food safety requirement?” It is your responsibility to understand your target group and increase your knowledge and awareness of hazards (physical, chemical, biological and allergens) that are of a particular concern to the vulnerable group/s. Is the product intended to be consumed by sensitive groups who may be allergic to specific food ingredients. Are claims such as “free from” made on the product label and if so are such claims substantiated? Disclaimers such as “May Contain” should only be made where a thorough risk assessment identifies a residual risk of contamination by a food allergen after all reasonable control measures have been applied. Infants and young children are regarded as a vulnerable group when it comes to food safety. You need to think about what additional hazards may be specific to this target group (e.g. type of food, size of food, choking hazards, mineral levels). If elderly people are going to consume the product think about hazards that are specific to this group. Older adults are more susceptible to foodborne illness. The immune system often weakens as you get older and stomach acid also decreases, stomach acid plays an important role in reducing the number of bacteria in our intestinal tracts and the risk of illness. There are some foods that pregnant women are advised to avoid consuming because they can make the woman ill or harm the unborn child. Is the product to be consumed by people that have an impaired immune response (for instance those undergoing chemotherapy or have AIDS, premature infants or transplant recipients that take drugs to prevent their body from rejecting the new organ). Consideration should be given to that fact that the immune system may be prevented from attacking harmful microorganisms in food. Again, the HACCP team should consider the likely abuse/unintended use of the product by the customer or final consumer (See guidance on this under Preparatory Stage E). You should consider if the product you produce could result in it being sold to a market other than that intended. 2. The extent of any further processing of the food prior to consumption. Different microbiological criteria will apply depending on whether the food product is supplied raw, processed or ready to eat to the final consumer. The HACCP team will need to clearly define which of these categories applies to the food and what, if any, instructions will need to be provided to the customer to assure the safe consumption of the food. For example, if the product is supplied to the customer as a ready to eat food, this should be clearly stated on the labelling. Most importantly, however, the HACCP team will need to ensure that any decisions made during the hazard analysis element of the HACCP study takes into account the fact that the food will receive no further processing prior to consumption. Critical control points identified by the HACCP team in the production of such foods will need to “prevent or eliminate” hazards arising from the presence of pathogens such as Salmonella and E.coli o157. For other types of food, clear information, typically on the food label, should be provided to the consumer where steps are required to be taken prior to the consumption of food to make it safe. For example, a product containing raw poultry should be clearly labelled as such and include clear, validated cooking instructions. It may be that the identified critical control points for a raw or processed food are sufficient to reduce a hazard, such as Salmonella, to an “acceptable level” rather than total elimination because the food will be subjected to further processing by the customer. 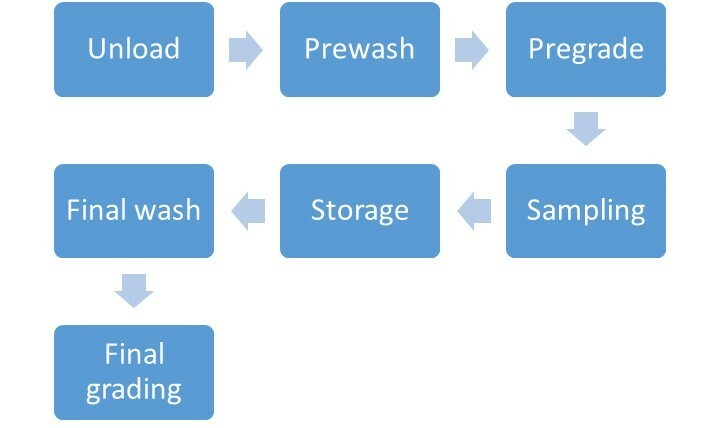 A process flow diagram shows all the steps involved in the process outlined in the scope of the study. The scope is defined in Preparatory Stage C.
The HACCP team or the person leading the development of the HACCP study should construct a flow diagram. Whatever format you choose, all steps in the process outlined in the scope of the study should be included. You may wish to use a schematic layout of the factory to help you. Knowledge of what actually occurs in your processes is essential. List each step in the process or module. You should consider what happens all the way from receiving the raw materials, through to at least the point of despatch or up to the point of final consumption of the product. You can use a linear or modular format for your process flow diagrams. This might depend on how complex your processes are, and whether parts of a process are the same for several products. View ‘Process flow diagrams’ for some examples of linear and modular diagrams and when you would use them. Draw a rough paper sketch of the product flow. Consider how the process is managed and what could realistically happen while it’s in progress. For example, consider optional and intermittent activities. The inclusion of relevant technical data will depend on the complexity of the operation. This data is useful at the Critical Control Points that you will identify later. A piece of equipment may have several functions (e.g. a bottle filling machine including rinsing, volumetric/gravity/vacuum/hot fill and capping functions). All functions should either be included in the description at the process step OR each function entered as a different process step. The flow diagram must be checked to verify that it is correct and shows all steps involved in the process as outlined in the Scope of the study (Preparatory Stage C). The flow diagram should be confirmed as being correct. It is recommended that this is carried out by someone not familiar with the process in addition to members of the HACCP team. The advantage of having someone not familiar with the process to check the diagram is that “they are a fresh pair of eyes”, and may identify a step that has been overlooked. Records of out-of-date flow diagrams must be kept. The flow diagram shall be subject to review and should be current and accurate at all times. Amend the flow diagram as the process changes. A hazard is something that has the potential to cause harm. This principle requires you to identify all such hazards that may reasonably occur in the production of your food. Hazards may be physical, chemical, allergenic or microbiological in nature and, depending on the size and complexity of your food business, you may need to consider each category in turn. You should already have completed much of the groundwork for this step in Preparatory Stage C by identifying relevant hazards. If you skipped this stage then you are encouraged to return and complete it now. Once you have produced a list of relevant hazards, you should refer to your process flow diagram (see Preparatory Stage G) and work through each process step of the flow diagram in a logical way, recording the relevant hazards on MyHACCP as you go. On completion of this stage you will have completed a list of hazards which are reasonably likely to occur in your food. This can be considered to be a "long list" which will now be subject to a process of evaluation to reduce it to a "short list" of hazards that should be considered further in this study. For a HACCP plan to be effective, control measures need to be targeted at those hazards which are more likely to occur in practice and which if they occur may lead to actual harm. The process of identifying such significant hazards is known as “Hazard Analysis” and requires you to work through each process step in turn, describing the identified hazards and then ranking them in terms of their likelihood of occurrence and severity. At the end of this process, you will be required to identify suitable control measures for those hazards ranked as significant (see Principle 1.3) but can ignore any hazards which you have ranked as insignificant. MyHACCP will invite you to write a brief description for each of the hazards that you identified in Principle 1.1. The description should refer to the source or cause of the hazard and whilst brief, should contain sufficient detail to properly characterise the hazard. When writing the hazard description you should include one of the following terms which provide an explanation of the nature of the hazards at each process step. Using the same terminology throughout the HACCP plan will help you to produce a coherent plan. So far you have identified a “long list” of hazards and briefly described how they are likely to have arisen in the food. The next task is one of the most important of the HACCP process: the identification of those hazards which are significant and the rejection of those which pose no significant risk to the consumer and can be controlled by your prerequisite programme. The purpose is to produce a “short list” of significant hazards which must be considered further by the HACCP study. This will be achieved by you scoring each of the identified hazards in terms of “Severity” and “Likelihood” to obtain a “Significance” score. MyHACCP uses a 1-3 scoring system to specify the severity of each identified hazard, in terms of the potential harm that could be caused to the consumer. A score of 1 indicates low severity of the hazard, and 3 is high severity. You should base your severity score purely on the potential outcome of the hazard remaining in the food at the time it is consumed. Do not consider the likelihood of this happening, as this is covered in the next stage. Pathogenic bacteria or their toxins which cause serious illness or may kill such as E.coli o157 and other VTEC, Salmonella, Clostridium botulinum. You should score the likelihood of the hazard actually occurring on a scale of 1 to 3. Score 1 indicates “Low” likelihood. Here it is unlikely, although still possible, that the event will occur. In other words, it is possible but not probable that the hazard will occur in practice. Score 2 indicates“Medium” likelihood. Here it is reasonably foreseeable that the hazard will occur. It could happen although there may not be any evidence of it having happened before. Score 3 indicates “High” likelihood. It is very likely that the hazard will occur. Once you have entered values for the “Severity” and “Likelihood” for a given hazard at a process step, a “Significance” rating score (9 is the maximum score) will automatically be generated. You should now identify a significance score above which you are going to consider the hazard to be significant and take it forward to the next stage. If you specify that a score of 3 is significant all those hazards scoring 3 or above will be taken through to the next stage in MyHACCP (Principle 1.3), all those hazards scoring 2 and below will be controlled and managed through effective prerequisite programmes. If you specify that a score of 4 is significant all those hazards scoring 4 or above will be taken through to the next stage in MyHACCP (Principle 1.3), all those hazards scoring 3 and below will be controlled and managed through effective prerequisite programmes. Control measures are actions and/or activities that are taken to prevent, eliminate or reduce the occurrence of a hazard that you have identified. Only significant hazards (those above your predetermined significance score trigger point) will be carried forward to this stage. For each significant hazard record what actions and/or activities are to be taken to prevent, eliminate or reduce the hazard to an acceptable level. Any action and/or activity that can be used to prevent or eliminate a food safety hazard or reduce it to an acceptable level. Conducting planned observations or measurements to assess whether a CCP is under control. More than one control measure may be necessary to effectively manage a specific hazard. For example, use of a metal detection system, maintenance of the detection system, and training on using it might all be needed to avoid the hazard of metal pieces in food. One control measure may manage more than one hazard. For instance, oil temperature and fry time can be an effective control for reducing both numbers of Salmonella and Campylobacter in fried food. Control measures are not always carried out at the same Process Step where the hazard arises. For example a hazard at Process Step 1 may be ‘presence of metal in raw material from supplier’; this may have several controls including the use of only pre-approved suppliers, or supply to an agreed specification. These controls will appear at Process Step 1, however a control measure at Process Step 15 ‘effective working metal detector and rejection system’ is also a control for this hazard. A Critical Control Point (CCP) is a step at which control can be applied and is essential to prevent or eliminate a food safety hazard, or reduce it to an acceptable level. The correct determination of CCPs is vital to ensure that there is effective management of food safety. The number of CCPs in a process will depend on the complexity of the process itself and the scope of the study (for example, whether there are just a few types of hazard, or lots of different hazards). CCPs should be determined through experience and judgement; this may be aided by the use of a decision tree. There are many different decision trees to choose from. The MyHACCP tool shows you the Codex decision tree or Campden BRI decision tree, but you are not restricted to using these. You can use a decision tree of your choice, some businesses devise their own. Using the Campden BRI decision tree, Process steps where hazards are effectively controlled by prerequisite food hygiene requirements will not be identified as CCPs. Using this tree will therefore typically generate fewer CCPs than the Codex decision tree. Your prerequisite food hygiene requirements will need to be well developed, implemented and maintained to ensure continued safe production of food. For example, if you take the physical hazard glass and run it through both decision trees, the Codex tree will identify it as a CCP whereas the Campden BRI decision tree will not, as long as effective prerequisite requirements are in place to control it. Apply the HACCP decision tree (whichever one you use) to each hazard at each process step. You will be prompted to record responses to the questions (yes or no). Campden BRI decision tree has 6 questions: Q1,Q2,Q2a,Q3,Q4,Q5 whereas the Codex decision tree has 5 questions: Q1, Q1a (N.B. Q1a 'Is control at this step necessary for safety?' is not identified by a number on the tree), Q2,Q3,Q4. If using the Codex Decision Tree the following guidance to each question may help. Q1. Do control preventative measure(s) exist? This refers to control measures. Q2. Is the step specifically designed to eliminate or reduce the likely occurrence of a hazard to an acceptable level? This refers to the process step (not the controls). Q3. Could contamination with identified hazard(s) occur in excess of acceptable level(s) or could these increase to unacceptable levels? Think about this in terms of 'if you lost control'. Q4. Will a subsequent step eliminate identified hazard(s) or reduce likely occurrence to an acceptable level? This refers to whether there is another process step further on in the process flow diagram that will eliminate identified hazard(s) or reduce likely occurrence to an acceptable level. You should keep a record of the decision tree you use and the reasons for your answers to each of the questions asked. If in doubt over the answer to a question, assume the worst situation until you have evidence to say otherwise. If no CCPs are identified, you should look again at the decision tree you used and check your answers to the questions, in case you have missed anything. However, if you are using Operational Pre-Requisite Programmes (OPRP), these may be controlling some significant hazards in your process. Operational Pre-Requisite Programmes are broad controls (for example, temperature control) which may be critical to food safety. You should keep evidence of how you determined whether control of each hazard is a CCP or not. If your decisions are based on the experience and judgment of HACCP team members, you should document their experience and the reasons for the judgments made, for every hazard you considered. If you are using a decision tree to help with this decision-making process, you should keep a copy of the decision tree you use. A review of this principle should be planned for and triggered if there are changes within the company (e.g. a change to the process, ingredients, products, technology). Principle 6 includes further details on reviewing your HACCP plan. Corrective action should be taken by nominated persons whenever monitoring reveals that critical limits are not being achieved at critical control points. Corrective actions intended to prevent loss of control at a CCP: This may become apparent when monitoring at a critical control point identifies a failure to achieve target values but the critical limits have not yet been breached. Appropriate responses to this type of event may be an adjustment of the process to prevent loss of control and an investigation into why the target values were not achieved. You must decide upon and document specific corrective actions that are to be taken if monitoring results for a CCP show that there has been a failure to meet the critical limit. The action to be taken must ensure that the CCP is brought back under control. What are you going to do straight away? Think about the need to stop the process; quarantine the product; and make quick adjustments to relevant equipment or the process for example by increasing the process temperature or extending the process time. What are you going to do about affected product that has been produced since the last good check? (This may be in storage/despatch.) This does not include recalling the product, because monitoring should be sufficient to capture the issue before the product has left site. Think about the need to quarantine the product from the last good check i.e. product manufactured during out-of-control conditions, disposal of the product. What are you going to do to in the future? Think about reworking the product if this is appropriate, carrying out an investigation (review cause and correction to prevent recurrence), disposal of the product. Allocate clear responsibility for the above, for instance who is authorised to dispose/rework the product or take the appropriate corrective action. Are all personnel trained and competent for performing the activities stated? Think about training and competency of personnel involved with any of the above. Document the corrective action to be taken when a CCP exceeds its critical limit and who is responsible for this action, or other actions such as disposal, rework. Relevant records must be kept including training records and what happened to the batch of product that was affected by the corrective action. In a well-organised system it should be possible to identify a procedure which contains the details of the corrective action and who has the authority to authorise the corrective action. A review of this principle should be scheduled and triggered if there are changes within the business as outlined in Principle 6. Verification is the principle which confirms that the HACCP plan if followed will produce safe food for the final consumer. Validation is the process by which you can prove that all of the judgements and assumptions that you have made to identify and evaluate relevant hazards, identify controls, correctly select critical control points, establish effective monitoring and corrective action procedures are all based on scientific fact. If each and every component of the HACCP system is based on science, then the whole system will be valid. You should reference an authority (journal, guidance, textbook) for each identified hazard or record the reasoning of the HACCP team for the inclusion of each hazard in the HACCP plan. You should include a written justification for the hazard evaluation process used to identify significant hazards in Principle 1.2. An explanation of why a given hazard has been discounted should be included. You should specify the method used to select critical control points . For example, use of the Codex Alimentarius decision tree. Critical limits can often be validated by reference to relevant literature such as legislation or Industry Guides. If such critical limits are selected then you must demonstrate that your process is capable of operating at the proposed critical limits. If there is no published evidence that proposed critical limits will be sufficient to achieve control at a CCP, it will be necessary to conduct suitable validation exercises such as mathematical and/or microbiological modelling supported by challenge testing or other relevant studies. Where a corrective action includes an option to rework or reuse a non-conforming product, evidence must be provided to guarantee that such reuse will result in safe food. This may seem like a complicated process but in practice there are well established safe methods of production for most common types of foods. As such, reference to guidance published by respected bodies such as the Food Standards Agency, Campden BRI, Leatherhead Food Research or the Institute of Food Research will often suffice. In addition to this, the validation plan would need to demonstrate that the equipment used to boil the hams is capable of reaching and maintaining this temperature for the required time. Alternatively, should the business decide to cook the joints at 75°C for 45 minutes instead of 90°C for 10 minutes, they would need to produce their own evidence that this would be adequate to control Clostridium botulinum, which might involve the recruitment of specialist consultants and the use of microbiological modelling. The process of verification involves taking sufficient steps to ensure that the procedures set out in the HACCP plan are working in practice and in particular that the critical limits are sufficient to ensure that the identified hazards are controlled at critical control points. Taking measurements, for example temperatures, at various points along the process to ensure that the system is behaving as expected. Targeted microbiological and/or chemical sampling of intermediate and final products to ensure that the food is meeting expected standards. Auditing documents throughout the system to ensure that the correct information is captured, recorded and acted upon in accordance with the HACCP plan. External audits on suppliers to verify that raw materials meet expected criteria. Staff assessments to ensure that procedures are fully understood and that staff are competent to perform any tasks allocated to them. Trend analysis of monitoring data to determine whether process controls are adequate and tolerances realistic. Analysis of customer complaints and third party audits to identify any potential gaps in the HACCP plan. Analysis of waste and rework figures to ensure that they correspond with records of corrective actions. Your HACCP plan should be up-to-date at all times and reflect any changes that may have taken place since the HACCP study was last carried out. It is recommended that reviews of the HACCP system should be carried out on a routine basis, so all HACCP plans should have built into them a scheduled review which should take place at a prescribed time interval even if nothing has changed. At an absolute minimum this should be annually and cover all areas of the HACCP plan. Any changes should be recorded and a validation study carried out to ensure that the HACCP plan is still capable of producing safe food. Once a review has occurred it must be documented even if nothing has changed. Those responsible for carrying out a review (usually the HACCP team in larger businesses) need to ensure that a proposed change does not adversely affect conclusions reached in the HACCP study and compromise product safety, and that the HACCP study is kept up-to-date. Records of validation and verification studies are to be kept as evidence that they have been carried out successfully and to assist with a due-diligence defence. Efficient and accurate record-keeping is essential to the application of a HACCP system. In the unfortunate event of a food safety incident that is connected to your products you may have to show that you have taken all reasonable precautions to produce food safely. Demonstrating that the principles of HACCP have been correctly applied as required by law and that documentation and records are kept, may provide evidence of due diligence in the event of legal action. Appropriate to the nature and size of the operation – your local environmental health practitioner will be able to guide you on this requirement. Sufficient to assist the business to verify that the HACCP controls are in place and being maintained. How are they to be stored – e.g. hard copy, electronic? Where are the documents to be stored? Who is responsible for the records? Who needs frequent access to the records? A review of this principle should be scheduled and triggered if there are changes within the company (see Principle 6). How is the document controlled with regards to update and issue etc? How is change and version control managed?